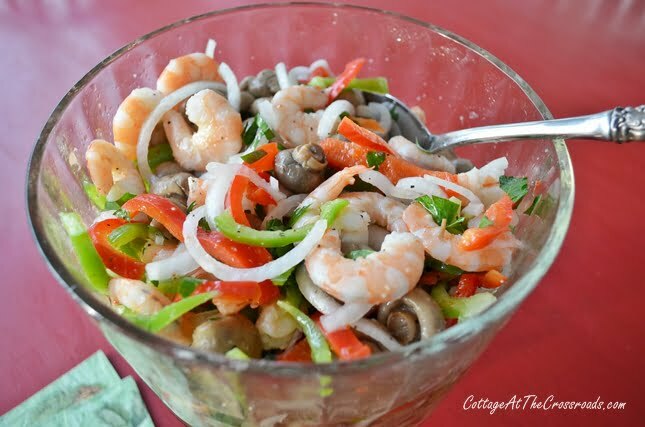 In this post, you’ll find the recipe for delicious marinated shrimp. You can use fresh or frozen shrimp and can make it ahead. Can you believe it? In just a few days it will be Christmas, and I wanted to share with you a dish that we almost always have when our family gets together Christmas Eve. 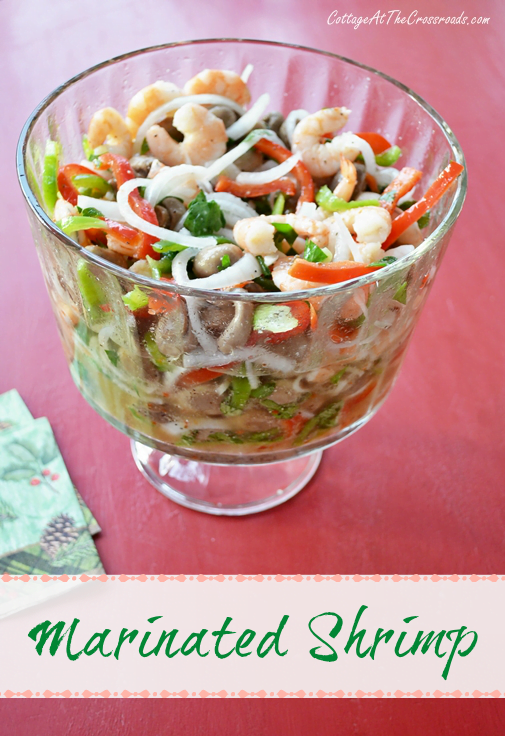 It’s marinated shrimp, and it’s super easy to prepare. It’s a great celebratory dish, and the best thing is that you can prepare it in advance. 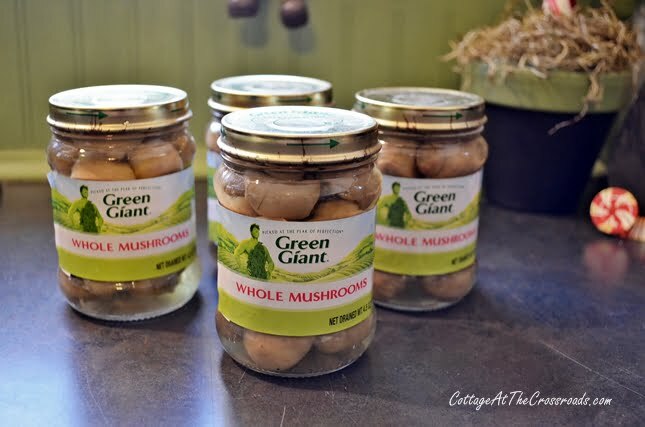 First you will need several jars of button mushrooms. Drain the mushrooms. Next you will need to some Zesty Italian Dressing. 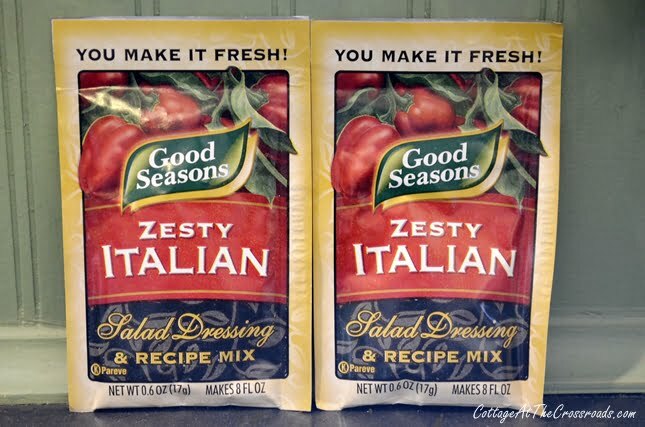 I mixed up some of this because I already had these packages, but I usually just use 2 large bottles of Zesty Italian salad dressing. Pour the dressing over the mushrooms. 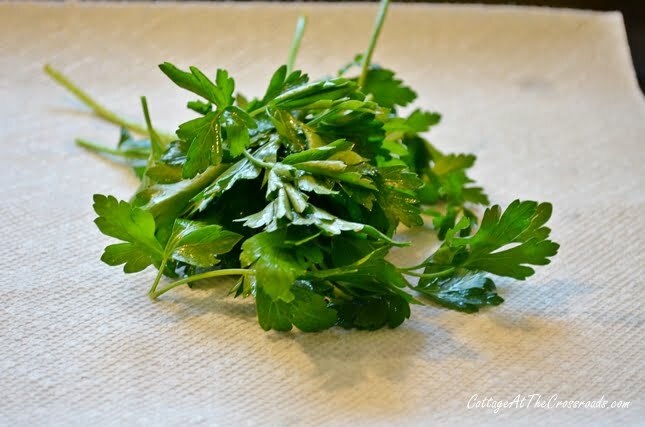 Chop a small bunch of fresh parsley and throw it in the mixture. 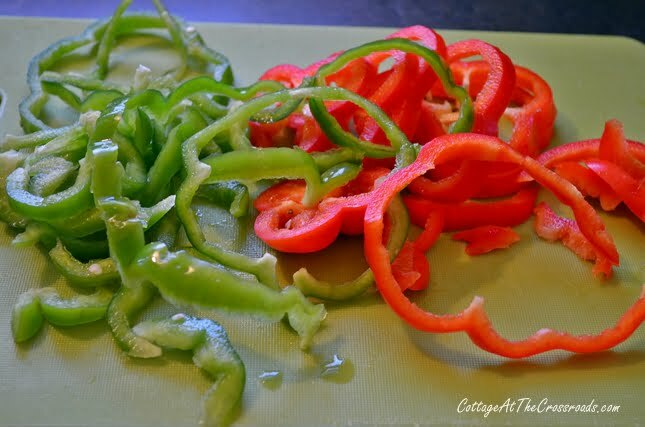 Wash and cut a red and green pepper into rings and then cut the rings into smaller pieces. Add these to the mixture. 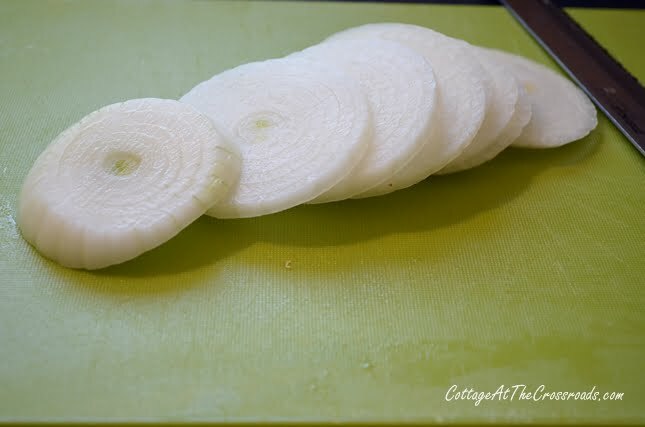 Slice a medium sweet onion into thin rings, cut the rings in half, and throw them in. Let all the ingredients marinate while you’re preparing the shrimp. 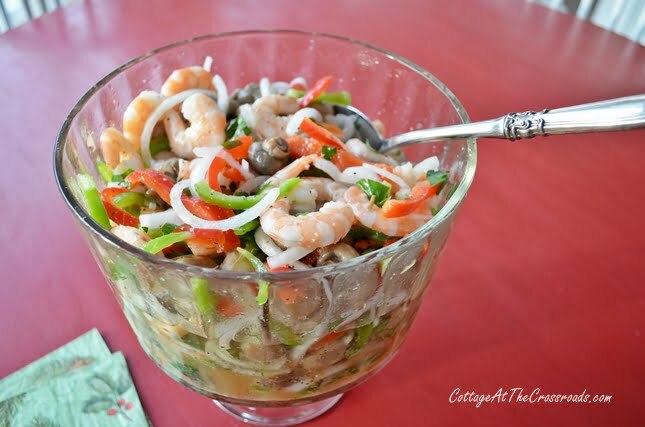 This dish is best prepared with fresh, local shrimp but since we live inland now, we use frozen shrimp. This is about 3 1/2 pounds of frozen shrimp. After it has thawed, cook it in a pot of boiling water with some Old Bay seasoning. Take it off the heat as soon as the shrimp rise to the top of the boiling water. Immediately drain the shrimp in a colander and add ice to cool them down. 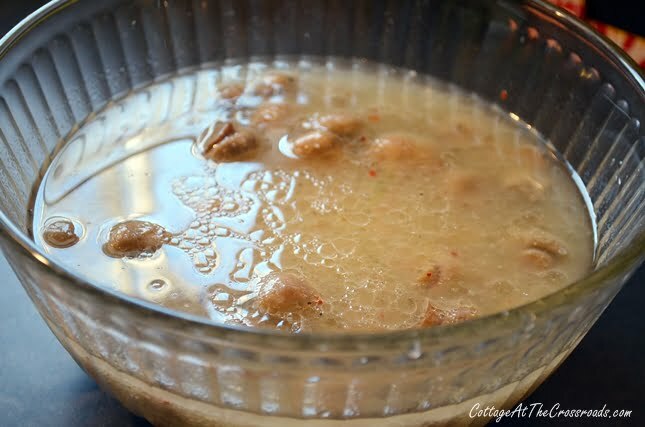 When they have cooled, peel and devein the shrimp and add the shrimp to the mixture. Place in the refrigerator and marinate for several hours. This dish looks very pretty when placed in a clear trifle bowl. Sometimes I like to serve it in these antique glass fish plates that I’ve had forever! It is so, so good! You won’t have any leftovers, I guarantee you! An easy and delicious appetizer that makes a great party dish! 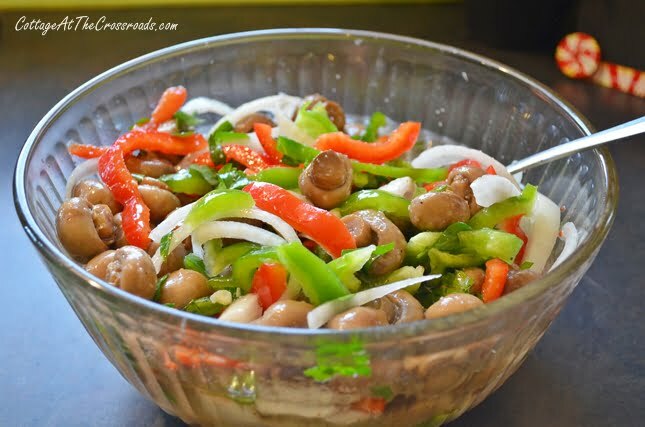 Drain the button mushrooms, place them in a large bowl, and pour in the 2 bottles of salad dressing. Cut the onion into thin slices and then cut the slices in half. Add to the dressing and mushroom mixture. Cut the peppers into thin rings and then cut the rings into bite-size pieces. Add these to the dressing mixture. Add the entire bottle of capers (including the juice) into the dressing mixture. Dice the parsley into small pieces and add to the dressing mixture. Add the cooked and peeled shrimp to the mixture. Chill and marinate for at least 3 hours before serving. 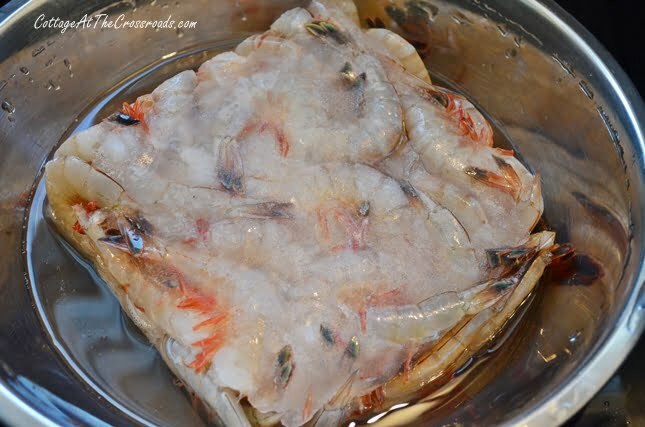 If using frozen shrimp, thaw and rinse. If using fresh shrimp, rinse well. Bring a large stockpot of water to a rolling boil. Add 2 tablespoons of Old Bay Seasoning. Add the shrimp to the boiling water and continue to cook until the shrimp start rising to the top. Remove from the heat and drain in a colander. Add ice to the top of the shrimp to stop the cooking process. It's very important to not overcook the shrimp! This dish looks very pretty when it is served in a glass trifle bowl. Yum, my mother is watering just thinking about this. 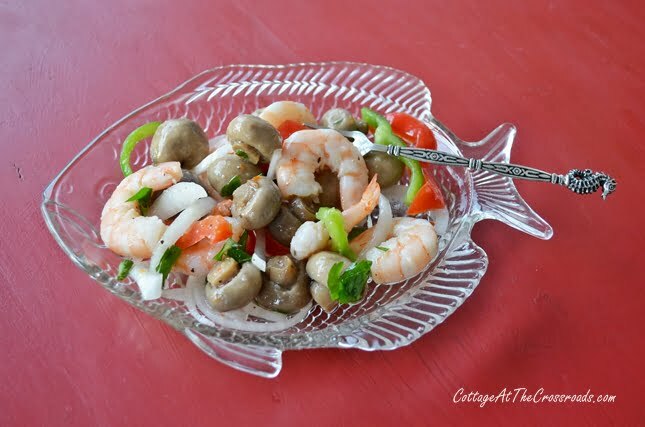 Shrimp and mushroom marinated in Italian dressing is delicious. Pinning. This looks delicious! Going to have to try this! My family would love this at Christmas! It sounds so good and who doesn’t love shrimp?? We eat a ton of shrimp. I get it every week from Costco. This recipe sounds delish, Jane!! As I live in Germany I am not sure what you mean by bottle of Dressing and small bottle of capers. How much in ml or gramms would that be???? Please help. The recipe has been updated to include the number of ounces. Hope that helps! 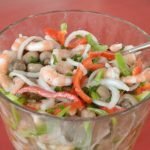 We love marinated or pickled shrimp Jane! My MIL has a recipe she has made for years, love the addition of the mushrooms in yours! Yummy Jane. You always have colorful festive looking dishes. Have a wonderful Christmas. This looks amazing. Fresh and tasty for sure. I actually got shrimp at the grocery yesterday. 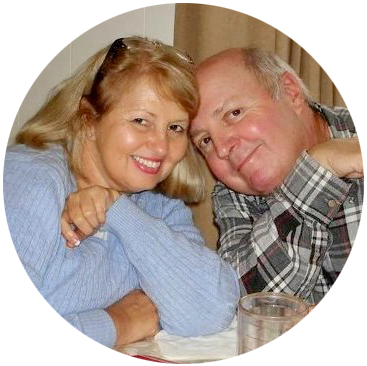 Hoping your Christmas is lovely Jane!